Accurate tissues levels of mercury and aluminum which are contained in vaccines ,mercury from dental amalgams, and environmental exposures of other heavy metals can all be discovered easily through hair testing. Toxic Heavy Metals Are Everywhere! Once someone has been exposed to a toxic metal, they can be found throughout the body, in tissues and inside the cells themselves. Very soon after exposure, a toxic metal leaves the blood and is either eliminated or stored in other organs and tissues of the body long term. Blood tests are not effective in identifying the actual tissue levels of toxicity, unless the contamination is recent within a week or two, or unless it is a continuously occurring exposure. The HTMA Hair test provides a comprehensive analysis report with detailed graphs for 8 toxic metals, as well as and 9 toxic metal ratios. Toxic metals do not always show up on a hair analysis test on the first test. Depending on the state of your body’s energy levels, it may take several tests before the toxic metals show up in the hair. There are 8 toxic elements in the hair test. These heavy metals are understood for their interference upon normal biochemical function and causing numerous imbalances in the body. Disorders associated with aluminum toxicity include: Autism, Alzheimer’s Disease, anxiety, conjunctivitis, eczema, upper airway irritation, pneumoconiosis, and especially with dialysis persons, neurotoxicity and osteomalacia. 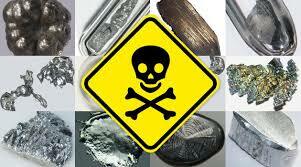 Disorders associated with antimony toxicity include: Cardiotoxicity which occurs with antimony pharmaceuticals. Occupational exposure which includes irritation of mucus membranes, eczema, chemical burns, perforation of the nasal septum, antimony spots, benign pneumoconiosis and possible lung cancer risk. Antimony in combination with a strong acid leads to stibine toxicity with hemolysis, shock, CNS symptoms and death due to anuria. Disorders associated with arsenic toxicity include: Acute effects of vomiting, colic and diarrhea, fever, cardiotoxicity, shock, and death. Inhaled arsine causes dizziness, headache, hemolysis, jaundice, kidney damage and death. Chronic effects include sensorimotor neuropathy, eczema, hyperkeratosis, hyperpigmentation. Vascular effects including Raynaud’s Syndrome, acrocyanosis and necrosis. Arsenic toxicity is also associated with lung cancer. Disorders associated with beryllium toxicity include: Acute effects of allergic dermatitis and chemical pneumonia. Chronic effects of beryllium are berylliosis – granulomatous lung disease. Disorders associated with cadmium toxicity include the acute effects are toxic pneumonitis, which is the inflammation of the walls of the alveoli in the lungs. Chronic effects include renal dysfunction, nephropathy and osteomalacia. Long term exposure can result in emphysema and lung cancer. Disorders associated with inorganic lead toxicity include encephalopathy, seizures, decreased intellectual performance of children, anemia and lead palsy in adults. Acute effects include nephro toxicity, GI upset anorexia, dysphagia, constipation, renal dysfunction, dental caries and periodontitis, tooth loss . Organic lead toxicity can cause sleepiness, dizziness, fatigue, insomnia and psychosis. Disorders associated with acute exposure to mercury by inhalation include chemical pneumonitis and pulmonary edema. Ingestion of organic compounds of mercury can cause gastro-intestinal irritation, vomiting, bloody diarrhea and stomach pains. Dermal exposure of mercury can cause contact dermatitis. Mercury toxicity and central nervous system effects include erethism, restlessness, insomnia, difficulty concentrating and memory deficits and intention tremor and gingivitis. Nephrotoxic effects. In children mercury toxicity can result in pink disease which is a reddish scaly skin eruption. Methyl mercury toxicity causes paraesthesias, ataxias, visual field defects and deafness. Congenital exposure of mercury may lead to cerebral palsy. Disorders associated with uranium toxicity include serious medical consequences. The kidneys though are considered the primary target organ for uranium chemical toxicity. Health conditions associated with uranium toxicity include: non-malignant respiratory disease such as fibrosis, emphysema and nephrotoxicity. Reproductive and developmental health issues are also reported. Extremely high acute exposures have also been lethal due to renal failure from oral or inhaled exposure or pulmonary failure from inhalation exposure. Exposures: Utilized in drilling muds, glass, ceramic glazes, paper, pesticides, and X-Ray contrast material. Disorders: Inhalation with insoluble form causes benign pneumoconiosis (Baritosis) and soluble salts cause hypokalemia. Acute poisoning of barium results in smooth muscle stimulation, vomiting, colic, diarrhea and eventual paralysis. Exposures: Present in food and water especially in Northern Europe. It is an essential trace element. Used in the steel industry, welding, photographic emulsions and wood preservatives. Hexavalent Cr (VII) is more toxic then trivalent Cr (III). Disorders: Cr (VI) – Corrosion of the nasal septum and circumscribed ulcers or chrome holes. Cr (III) – allergen, eczema and asthma. Lung cancer. Cobalt – It is also an essential trace element. Exposures: Production of hard metal, which is cemented by a cobalt binder. Cobalt compounds are in catalysts and in desiccators. Disorders: Airway irritation, asthma and “hard metal pneumoconiosis.” Eczema, especially in the hand. Cardiomyopathy has been reported among beer drinkers. Copper – It is also an essential trace element. Exposures: Production of electric equipment, alloys, plumbing and heating systems. Disorders: Metal fume fever. Patients with Wilson’s disease are at risk for copper toxicity. Iron – It is also an essential trace element. Exposures: Toxic effects are manifested with overdose of Iron supplements. Foundry workers, grinders, welders are exposed to Iron Oxide fume. Disorders: Overdose – GI upset/lesions, metabolic acidosis, toxic hepatitis and shock. Chronic overload – Hemachromatosis – hemasiderosis, liver cirrhosis and cancer. Inhalation – Pulmonary siderosis. Exposures: Used in alloys, surface treatment of metals, catalysts in electronics and production of nickel-cadmium batteries. Disorders: Cancer of the nasal sinuses and lung cancer. Contact eczema. Nickel carbonyl may cause shortness of breath, headache, dizziness, abdominal pain, vomiting, pulmonary symptoms, cerebral toxicity and death.